A roaring, cozy fire is as picture-perfect for the winter season as an oscillating fan blowing in front of an open window next to an ice-cold lemonade is for summer. When summertime ends, most of us store our fans away for coming months, since fans are synonymous with beating the heat. After all, moving air is cooler air – hence why it’s referred to as a “cool breeze.” But what if we’re missing out on a vital fan function during the winter months? While fans can (and often do) help cool you down, their primary function is simply air circulation. Fans can also be utilized to spread warm air. If you have a fireplace that only heats the two square feet around it, a fan can help amplify the warmth to the whole room. Here’s a look at how your fan can help keep your family warm in the winter by spreading fireplace heat. It’s a common belief that heat rises. According to Energy Vanguard, that’s not exactly true. Heat rises, but it also falls. It can also move up, down, or sideways if the environment is right. While hot air is lighter than cold, heat will go wherever it is directed, and it can be directed up or down depending on a room’s air flow. Heat particles are generally more spread out than colder ones, making them lighter. This creates a layering effect where hot air inevitably sets itself on top of cold air. But this balance can be easily disrupted. With this knowledge in mind, you can stop cold air from settling by continuously disrupting it in one of two ways. The first is to blast the warm air down into the cold. The second is to draw the cold air up into the warmth. So, while air in your face is a great idea during summer, it would be better to direct elevated fans toward the floor in winter. You can achieve this by using a wall-mount fan like the 18″ Oscillating Wall-Mount Fan with Remote or the Air Flexor® Remote Control High Velocity Fan. Both allow the head of the fan to be tilted in multiple positions, allowing you to push air down or up. Bonus for a wall-mount fan: once it’s safely secured on the wall, you don’t have to worry about moving it every season, since it can be consistently in use. It also saves on floor space. If you have a mounted ceiling fan, try reversing the blade direction to send warm air down from the ceiling. Pointing a pedestal fan with an adjustable head (the 16″ Oscillating Stand Fan comes equipped with a tilt-back fan head, as does a fan like the 18” Pedestal Fan with Remote Control) at the ceiling will have a similar effect. A wide variety of fans exist that specialize in promoting an air current within a room. Air circulators are designed to enhance air flow and most models come equipped with adjustable pivoting heads to maximize their reach. Devices like the portable 20″ Air Circulator Fan are made to move where you need them most; the pivot can point directly at the ceiling or down to the floor, as needed. Air circulator fans are versatile; some are made to sit on the floor, countertop, or shelf, while others are outfitted to mount to walls. One important thing to note: Many of these units contain plastic elements that can melt in direct heat or cause a safety hazard. It is not recommended that they be placed directly on top of a fireplace without some sort of buffer. Most fans, like box fans or tower fans, also have multiple energy-efficient speed settings. Save the highest speed for a hot summer’s day; your fan does not have to be on high to be effective at spreading heat. Setting your fan on a low and quiet speed will provide enough movement to warm the room. When used for circulating air in summer and winter, your fan will have a permanent place in your living space all year long. Knowing that your fan will be there, you may want to invest in a fan style that suits your home décor and blends in to your room design. The wall-mount fans mentioned earlier save on floor space and are unobtrusive when mounted. A slim tower fan is a fan that doesn’t look like a fan; the sleek vertical design fits in a smaller space and has a modern look. The Oscillating Tower Fan with Twin Grills comes with an adjustable split grill for up to 30% more room coverage. Pedestal fans also come in a variety of widths and colors to match your existing décor. A white 18″ Elegance & Performance Pedestal Fan adjusts to the height needed in the room, and the black 18” Pedestal Fan with Remote offers unique, clean blade shapes that deliver powerful air flow. Fans have a tendency to dry the air they’re circulating, which is fine – in summer. In winter, however, the air already has low humidity. This means that the air will already be very dry. If you’re heating your house with a fireplace and using fans to spread that warm current, you’re going to reduce the moisture in your air. Luckily, there are a couple of solutions to this problem. The first is the simplest: Place water on top of your fireplace – preferably in a safe kettle-like container. The fire will heat the water just like you were making tea. If left alone long enough, the water from the kettle will begin to steam upward, putting water vapor into the room and humidifying the air. However, this method can be messy or even dangerous if you choose the wrong container. 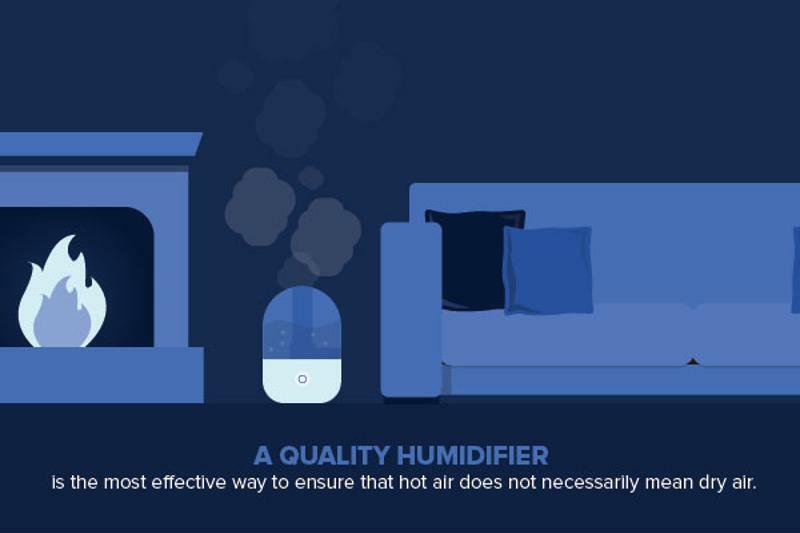 Investing in a quality humidifier is the most effective way to ensure that hot air does not necessarily mean dry air. Look for devices that offer continuous water recirculation, which self-cleans filters and maintains high efficiency. The moisture protects your skin and sinuses from the negative effects of the dry air. Paired with your fan and your roaring fire, you have everything you need to enhance the effectiveness of your fireplace this winter.